Fox news: death toll rises! A second murder rampage on Talbot Woods chicken coups has left local poultry owners scratching around for clues as to the culprit. The first attack, back in November, took place at the home of the Bournemouth University caretaker known as Martin ‘Red Eleven.’ In a first hand account he described the scene of carnage that greeted him following a clandestine nighttime attack: “It was very sad, one had no neck,” he said. “The friendliest ones went first.” he continued. Seven were left for dead leaving a sole survivor, known as “Drumstick” to recover at the roost all alone. The latest mid January attack brings the unconfirmed death toll to around 14. 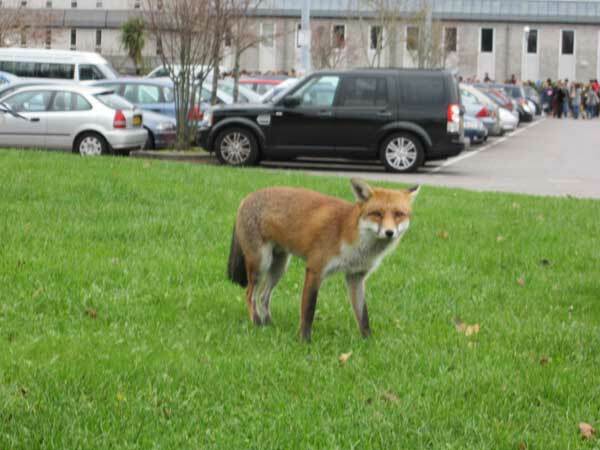 The prime suspect, thought to be an adult male fox, has been spotted wandering around campus. Sightings suggest he is a brazen individual, having come into close contact with a number of people working at the University. PC Andy Scarratt spotted Sly around University during daylight hours: “He’s as bold as you like, walking around campus, and goes over there an kills chickens. He must have had 12 or 14 now.” he said. BU Security guard Dennis Riley has been following Sly’s movements: “He seems to do a circular route” and is “not bothered by traffic or people”. As well as chickens the wandering rogue also has an appetite for lady foxes. According to wildlifeonline the breeding season for red foxes runs from December to February. Following the November attack “Drumstick” is reported to be recovering well and has had a second chicken bought in to keep her company. Driven by curiosity, Marc has travelled widely throughout North America, Eastern Europe, EU, Israel & Egypt; as well as Thailand and Australia. He has written along the way and is now focused on developing his skills in Journalism. In his spare time he likes to play piano and practice yoga. Follow him on twitter: @perryeyes.